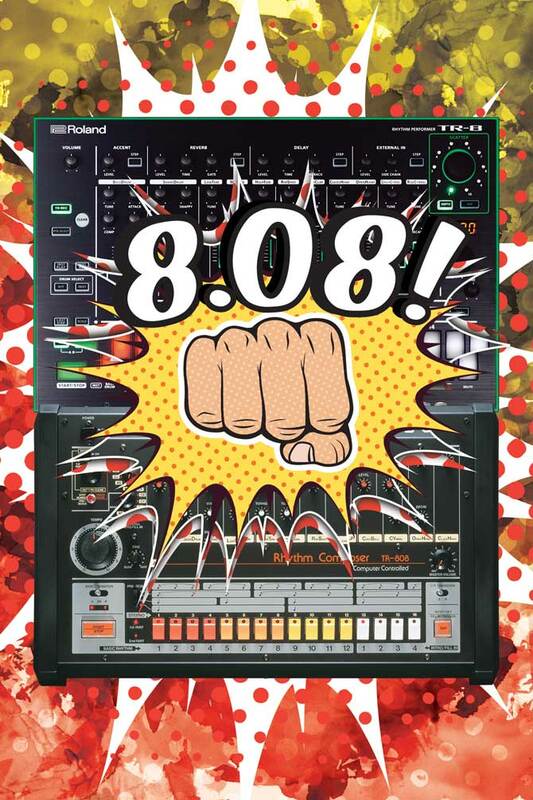 Celebrate 808 Day on August 8th. Low End Theory is an influential, world-renowned Los Angeles nightclub that pushes the boundaries of experimental music. In celebration of 808 Day, they will be hosting the Low End Theory Festival 2015, an annual event now in its second year. It’ll feature live music and production workshops with beat-making techniques and Roland synth demos, plus Roland-sponsored gear and T-shirt giveaways and surprises throughout the day. Cutting-edge electronic music production and DJ school Dubspot is celebrating 808 Day on their New York and L.A. campuses. In honor of the TR that started it all, they’re inviting all musicians to participate in beat production workshops and hands-on demos, and to enjoy artist performances, discounts on Roland TR-8s, special gear giveaways, and more! Kerry Brown, a multi-instrumentalist, artist manager, record producer, engineer, composer, and founding member of L.A.’s Six01 artist collective, is sponsoring “8.08!” The event will take place at the Six01 Studio Sound Lab in Burbank, California, and will feature live musical performances from David J (Bauhaus, Love and Rockets), Bon Harris (Nitzer Ebb), Brian Liesegang (Nine Inch Nails, Filter), and Kerry Brown (Catherine), as well as an art exhibition by CANTSTOPGOODBOY and Serj Tankian (System of a Down). This event will be streaming live at starryrecords.net/808day starting at 8 p.m. PST. The 8.08! event will take place at Six01 Studio Sound Lab in Burbank, CA. In the UK, the film 808 premieres on Saturday evening, 8/8/15, at the British Film Institute (BFI) in London. The screening will begin at 8:08 p.m. BST at the BFI Southbank cinema venue as part of the Sonic Cinema series. At this event, noted dance musicians A Guy Called Gerald and Graham Massey will be demonstrating how to program beats on the original TR-808 and the new AIRA TR-8 from 7-8 p.m. in the main ticket hall at BFI. They’ll also be performing in the bar area for free starting about 11 p.m. 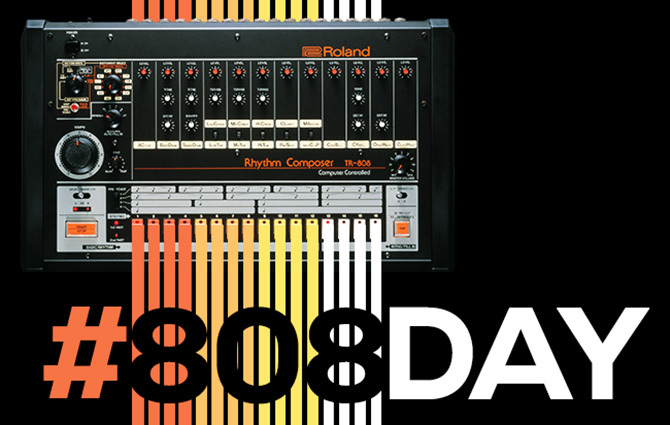 Independent film producers have recently announced 808, an engaging documentary film that shares the enormous influence the TR-808 has had on music and pop culture since the 1980s. The film is currently being screened globally and is expected for general release in the fall. A diverse lineup of artists and producers appear, including Afrika Bambaataa, Fatboy Slim, Rick Rubin, Phil Collins, Questlove, David Guetta, and many others. Introduced 35 years ago, the Roland TR-808 Rhythm Composer was one of the first affordable and widely available programmable drum machines to hit the market. Though only in production for approximately three years, its signature kick and snare—along with many other unique sounds—became tonal anchors for the hip hop and techno movements from the mid-’80s onward. 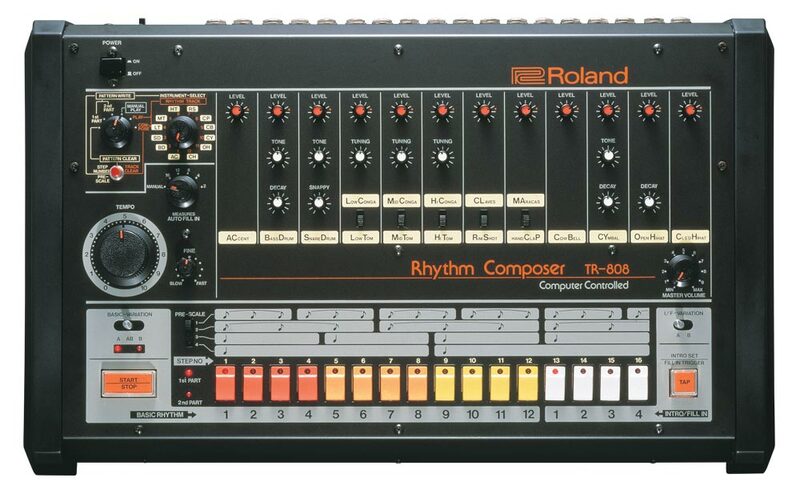 Commonly just called “the 808,” the instrument has been embraced by artists and producers of many genres. Its sound is heard on thousands of dance tracks and hit records, and it’s even been directly referenced in the lyrics of numerous songs over the last few decades. Despite the growing reliance on software-based instruments by today’s music producers, the original TR-808 still reigns supreme for many. In recognition of the instrument’s enduring popularity, Roland launched the TR-8 Rhythm Performer at the end of 2014, which combines the legendary 808 sound with many enhancements for modern production environments.